Yay! I finally finished the felted hat for Diana! She’s home with a sinus infection today so she was really happy to model the hat without having to show her face!! 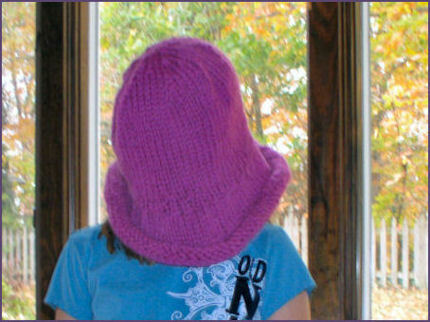 I started by looking at the Fiber Trends AC-1 Felted Hat for reference, but in the end I deviated quite a bit to get sizing that was appropriate for a 9-year-old girl! I’m actually proud of myself that I’m getting to know enough about hats by now that I could figure this out pretty much by myself! I’m looking forward to the day that Diana will be able to wear this cute little hat! Plus, it was good to get back to making one of my favorite things, to offset the ongoing nature of some longer-term projects. 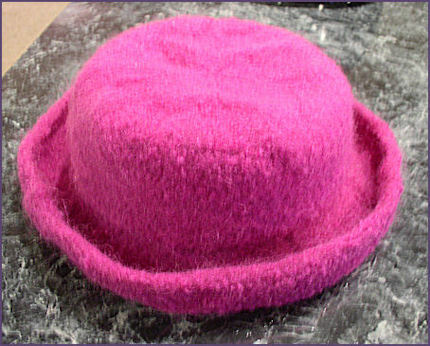 And here’s the hat after felting! Isn’t it cute? This was the first felting test for my new Kenmore front loader washer (nearly identical to the Whirlpool Duet) and I am happy with the results! Since my old front loader usually took three cycles to achieve a desired size, I decided to live dangerously so we set the washer on the “Sanitary” setting with a “No Spin” on the rinse cycle. I was so nervous when it came out of the wash; it looked like a tight little ball and smelled something like a wet dog! (wet sheep?) But with rigorous stretching and kneading, it took a nice shape fairly quickly. There’s a Gladware bowl underneath the hat for now as it dries, which happens to have the same diameter as my lovely child’s skull. I’ve been smoothing it every so often, and it feels a bit like working with dough! So this was my first experience felting with KnitPicks Wool of the Andes, and I do have to say that so far I am pleased! This is a nice yarn to felt with and very inexpensive, too. Where it used to cost me about $30 to make this hat, I can now do it for about $10. I am still working on a garter stitch hat band, which will be embellished with a rainbow-colored butterfly pin. I’m sure this hat will be gorgeous! I’m doin’ the happy dance!